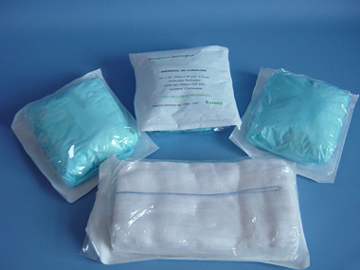 LAP SPONGE/ABDOMINAL PAD, STERILE: Made of 100% cotton gauze. Mainly for surgical use. Size(cm): 22.5 x 22.5, 30 x 30, 45 x 45 and so on. Ply: 2, 3, 4, 8, 16 and so on. Mesh per inch: 20 x 12, 19 x 15, 26 x 18, 30 x 20, 43 x 27, etc. With or without X- ray thread or tape. With or without cotton woven loop at one corner. Washed or non. Sewn at four sides. Steriled by EO, or electronic ray. Regular Packing for steriled: 5PCS/paper pouch, or Blister packing. Regular packing for non sterile: 100PCS/plastic bag. Good absorbency. The quality strictly conform to BP/USP standard. ISO & CE certificated. Besides, we also produce other gauze products like: GAUZE JUMBO ROLL. GAUZE ROLL in 4ply, or 2ply, or pillow, or cake. GAUZE ZIG ZAG. GAUZE FOLD PIECE. GAUZE SWAB/SPONGE. GAUZE BANDAGE ROLL. GAUZE BALL. OTHER GAUZE PRODUCTS. All of the above are made of 100% cotton. The quality strictly conform to BP/USP standard. ISO and CE certificated. More Product Features HS Code: 30059010 Model NO. : LAP SPONGE-S Standard: BP. Productivity: 4 x 40" containers/month Unit Price/Payment: t/t; l/c Origin: China Company: Shaoxing Gangfeng Hospital Products Co., Ltd.
Company: Shaoxing GANGFENG Hospital Products Co., Ltd.